Philemon Thomas, the son of Richard Thomas II and Frances Hawkins, was born 1763 in Virginia. By about age 16, in 1778, he was enlisted in Col. Archibald Little's North Carolina regiment. During the years of the Revolutionary War, he served 12 months as a private, 3 months as quartermaster, 12 months as sergeant and 7 months as ensign. Between these tours of duty he served briefly with scouting parties against the Tories. He served under Gen. Nathanael Green during the Battle of Guilford Court House. His older brother, Richard Thomas III, also began service under Col. Archibald Little in his North Carolina regiment. 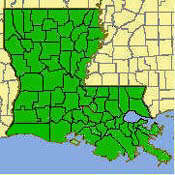 By 1806 he moved to Louisiana which had been purchased from France in 1803. He became a member of the Louisiana House of Representatives. He commanded the forces which captured the Spanish Fort at Baton Rouge in 1810. Also captured was Don Carlos Duhalt de Lassus, the Spanish governor of the Baton Rouge district. He was Major General of the Louisiana Militia in the War of 1812. He later served as U. S. Representative of Louisiana for two terms from 1831 to 1835.
of Kentucky and a member of her Legislature. to be a kind father and a firm Christian. Sie tibi un Terta levis.